Thoughts on Takeover Agreement Indemnities and Representations, A Sampler of Takeover Agreement Indemnities, and Takeover Representations—The Element of Reliance. The takeover agreement is a device used by a tenant's new landlord to assume, or "take over" the tenant's obligations under its old lease to induce the tenant to move into the new landlord's building. This LARG focuses upon the indemnities and representations contained in such agreements. 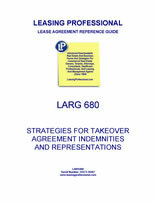 The first section contains an introductory discussion of takeover indemnities and representations. Numerous clauses are included in the subsequent sections. At first blush, it may seem like the points of the business deal in takeover agreements are the only things to worry about in the documentation. The tenant signs the new lease, vacates its old space, moves into its new premises, and its new landlord pays the rent under the old lease for the balance of the term. Cover those points and the paperwork is finished. It's simple, right? Usually it is not nearly so simple. That's because, in practice, sophisticated commercial landlords rarely make unconditional promises concerning the assumption of the tenant's obligations under the old lease. Takeovers cost the new landlord big dollars, and the new landlord doesn't want to get left holding the bag if the new lease goes sour. Accordingly, landlords negotiate to make agreements to pay the tenant's rent under the old lease and perform other leasehold obligations contingent upon the satisfaction of numerous conditions (e.g., no default by the tenant under the old or new lease, timely vacation of the old space and occupation of the new space by the tenant, satisfactory completion of the tenant's part of the work letter construction for the new space, satisfaction of releasing conditions for the old space, no litigation by the old landlord following the tenant's vacation of the old space, etc.). Qualifying the new landlord's assumption of those obligations can make the negotiation and drafting of the takeover agreement complicated. The language covering the business deal must precisely specify what obligations are assumed by the new landlord and whether such assumption is conditional, capped, limited as to duration, or otherwise qualified. But as important as the deal points are in the documentation, the indemnities and representations included in the takeover agreement can be almost as significant due to the nature of the takeover transaction. An indemnity is an agreement whereby one party agrees to protect the other from loss or damage caused by certain events (e.g., in the event of litigation commenced by the old landlord after the tenant vacates the old space, or for damage to the old premises caused by the tenant prior to or during its vacation of the space). Indemnities are important devices which allocate the risks inherent in the deal between the parties. For example, if the remaining term of the old lease is lengthy, the new landlord will want to mount a marketing campaign to sublease that space (assuming a termination deal cannot be worked out with the old landlord). The tenant will be the party signing the sublease (or subleases) as the sublessor. It is only reasonable for the tenant to ask for an indemnity from the new landlord for the obligations it assumes as the sublessor. After all, the new landlord will no doubt receive the sublease payments, and use them to offset the cost of the takeover deal. Likewise, the tenant will no doubt want an express indemnity from the new landlord with regard to the obligations of the old lease as soon as the tenant signs the new lease and takes possession of the new space. If the new landlord has taken those obligations over, shouldn't the new landlord give the tenant an indemnity for them? On the other side of the table, the new landlord should probably negotiate for the tenant to indemnify it with respect to any losses arising from the conduct or misconduct of the tenant affecting the old premises prior to the effective date of the takeover agreement (i.e., while the tenant was still in possession of the old premises). And shouldn't the tenant indemnify the new landlord for any loss or expense associated with service contracts (e.g., telecommunications or office equipment contracts) not transferable to the new premises executed between the tenant and third party vendors? Representations are statements in the takeover agreement made by one of the parties meant to be relied upon by the other. If the representation proves to be false, the party relying upon the representation can sue the representing party for damages. Such representations are critically important in takeover documentation because the new landlord is rarely in a position to verify the details concerning the old lease (e.g., the current amount of monthly rent and operating expense contribution payable under the old lease) directly with the old landlord. The old landlord is likely to be extremely hostile, if not litigious, if contacted directly by the new landlord about such matters. At a minimum, the old landlord might think the receipt of an estoppel letter pertaining to the old lease from the new landlord is not a proper method of introduction. As a result, the tenant in takeover deals commonly makes representations to the new landlord concerning the content of the old lease documents, the absence of default or assignment under the old lease, premises size, current monthly rent and operating expense obligations under the old lease, etc. The two sections that follow contain an assortment of takeover indemnity and representation clauses with commentary.